I totally get how frustrating that is. All parents want their kids to be kind, polite and respectful to everyone they interact with. Obviously, it’s important children know how to act in a civilized society – but let’s be honest, we also feel incredibly guilty or embarrassed when OUR kids are disrespectful. We can just feel the judgment of other parents when our son or daughter snaps back at the cashier at Target. So the big question remains, in a world where common courtesies come and go, how can we teach our kids to be respectful?! Both respectful to us and to other kids and adults? The answer is that WE have to model the respect we hope to see from our kids. The truth is, you may feel like you’re already doing that and the respect still isn’t reciprocated. If that’s the case for you, stay with me, my friend. As you’ll learn in this article, there are a few ways even well-intentioned parents accidentally undermine the development of this mutually respectful relationship without even knowing it. The good news is we can make a few simple tweaks to the way we interact with our children that will ENCOURAGE a mutually respectful relationship. When we make an intentional effort to model a respectful attitude for our children, they are more likely to mimic it. The idea that children deserve to be treated with respect and dignity is the foundation of Positive Parenting. What does it look like to show our kids respect? The list below is adapted from one of my all-time favorite parenting books: How to Talk So Kids Will Listen and Listen So Kids Will Talk by Adele Faber & Elaine Mazlish. This list is meant to give parents a heads up on the things we well-intended parents do that undermine the respect kids feel from us and offer a quick refresher on ways to SHOW respect in the simple day-in and day-out interactions. Not only will these strategies demonstrate respect for kids, but each suggestion will help foster their autonomy and reduce the power struggles in your home. That sounds like a win-win-win to me – respectful, capable AND compliant children? Sign me up! Parents are inquisitive creatures. We want the details. ALL THE DETAILS. When kids are on the firing line of our barrage of questions, it’s no wonder they clam up. While you may find younger children eager to share the details, as kids get older, they are less inclined to answer all your questions – especially if they sense the questions are coming from a place of judgment or a lack of confidence in them. Kids’ tight lips don’t necessarily mean they don’t want to share – they simply want control over when and how they spill the beans AND they want to know we have faith in them. To demonstrate respect for their good sense and judgment, we should simmer down on the questioning. By giving your child space to share in a comfortable way when he’s ready, you offer him the same respect you appreciate from others. After all, no one likes a boss who micromanages every detail of a project. Make sure you don’t micromanage every detail of your child’s life and you’ll be well on your way to seeing a more respectful attitude in return. NOTE: No questions about the micro-details of his day! You can always have a more substantive conversation later – when he’s had some time to decompress and when the conversation is on his terms. If you sometimes feel like YOU’RE on the firing line of your CHILD’S barrage of questions, stay engaged, show interest, but don’t be so quick to give an answer. When parents respond quickly to every question, request, or inquiry, children learn to depend on instant responses and feel frustrated when parents don’t respond with haste. When we don’t give a child an opportunity to figure out the answer for himself, we demonstrate a lack of confidence in his abilities and sow the seeds of helplessness and over-dependence on mommy or daddy. To avoid fueling helplessness, I encourage parents to respond with a question of their own. This is a wonderful way to put the monkey on your child’s back and give him the opportunity to wrestle with the question at hand. Unfortunately, responding in this way only discourages healthy communication down the road making kids less inclined to answer OUR questions as they get older (see #1). Keep the communication lines open and encouraging, but begin answering in ways that increase your child’s problem-solving skills and sense of autonomy. By doing this, mutual respect will be a natural byproduct! On a basic level, this may seem obvious to parents – let your child bathe himself, allow her to choose what clothes to wear, let him decide on his hairstyle. And most parents give this autonomy as kids get older. However, there are other more subtle ways we undermine both our younger and older kids’ control over their own bodies – wiping their nose, scrubbing food off their face, hiking up pants, pulling down shirts, etc. Once children are old enough to maintain basic hygiene, let them be! Refrain from brushing hair out of her eyes or wiping food off her face. Avoid tucking in his shirt or straightening his collar unannounced. As a parent, this is hard! You KNOW how annoying those bangs hanging in your eyes would feel! And so, in an effort to make things more comfortable for her, you give her hair a quick swipe or swiftly place the barrette you dug out of your purse. Unfortunately, when we do these “fixes” on a regular basis, kids view them as an invasion of physical privacy and it disempowers them to attend to their personal needs. By letting kids own their bodies and personal appearance, we show them the same level of respect we hope they will show others. We’ve all done it. We walk into a play date or family reunion or birthday party with our child by our side. A well-intentioned adult walks up enthusiastically and wants to know how 1st grade is going for our little man. We rescue the less socially confident (shy) child from an uncomfortable situation which inhibits them from developing skills for the future. Instead of jumping in to do things for our kids or answer for them – let them answer, struggle, and think for themselves. You’ll be amazed at how their sense of personal significance will grow. When children are more confident and capable – even in uncomfortable situations – the respect will flow more freely. For an older child, be silent and don’t answer. The awkward silence will encourage your child to speak up. If they still choose not to, don’t make a big deal out of it, just continue on in your conversation. Just imagine, you’ve planned the perfect pool day for your entire family. The sandwiches are made, towels are in the bag, pool toys are bursting out of the trunk and you’re determined to have a great day. As you walk onto the pool deck and lather your children in sunscreen, your older son cannonballs into the water with enthusiasm while your 6-year-old son sits solemnly on the pool chair. “I don’t want to go in the water,” he remarks. What was once meant to be a fun day at the pool has become a poolside power struggle. 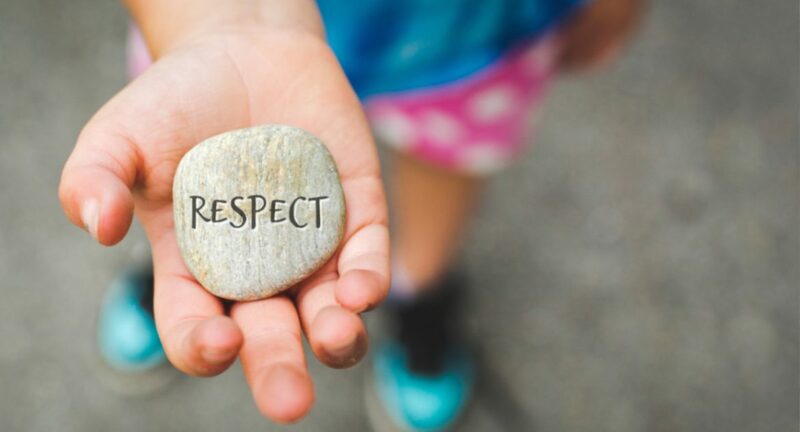 When we try to coerce children into doing something they don’t want to do or don’t feel comfortable doing, we miss an important opportunity to show respect. After all, our long-term goal is to raise self-motivated, capable, respectful and resilient humans, not ones who are easily coerced by the pressure of others. By shifting your language, you show Luke that you respect his decision and have faith he’ll take the dive when HE is ready. That allows him to take that leap – eventually – on his terms. Kids are accustomed to parents communicating with a lot of ordering, correcting and directing. When our children know we respect their decisions and trust they will follow through we create a mutual respect for one another. By implementing these 5 strategies, you will show your kids you respect them and you will empower them to have a greater sense of capability and autonomy. As an added bonus, when children feel valued and capable, they are less likely to engage in power struggles. Respect is a two-way street and when you choose to model mutual respect, you’ll be well on your way to raising respectful children. If other parenting questions came to mind while reading this, please know you’re not alone. It feels like as soon as you tackle one parenting issue, the next is waiting on the sidelines to jump in. If that’s the case for you, I’d love to have you JOIN ME FOR A FREE ONLINE CLASS. I will teach you how to get your kids to listen without nagging, reminding or yelling (which will also help foster a mutually respectful relationship with your child). As always, keep up the good work, my friend! Raising those kiddos is the most important job you’ll ever do and I’m grateful to support you on this journey.